Year 1, in the spring of 2013, and organized primarily by Lauro Vazquez (MFA, ND, '13), the participants were: Marcelo Hernandez Castillo (University of Michigan), Lauren Espinoza (Arizona State University), Thade Correa (University of Notre Dame) and Lynda Letona (University of Notre Dame). The gathering took place in South Bend, IN. Year 2, in the spring of 2014, and organized primarily by the aforementioned Lynda Letona and Lauro Vazquez, the participants were: Javier Zamora (New York University), Elizabeth Acevedo (University of Maryland), Nayelly Barrios (McNeese State University), Suzi F. Garcia (University of Notre Dame), Jonathan Diaz (University of Notre Dame). The gathering took place in South Bend, IN and included time with special guests Laurie Ann Guerrero and Francisco X. Alarcón. 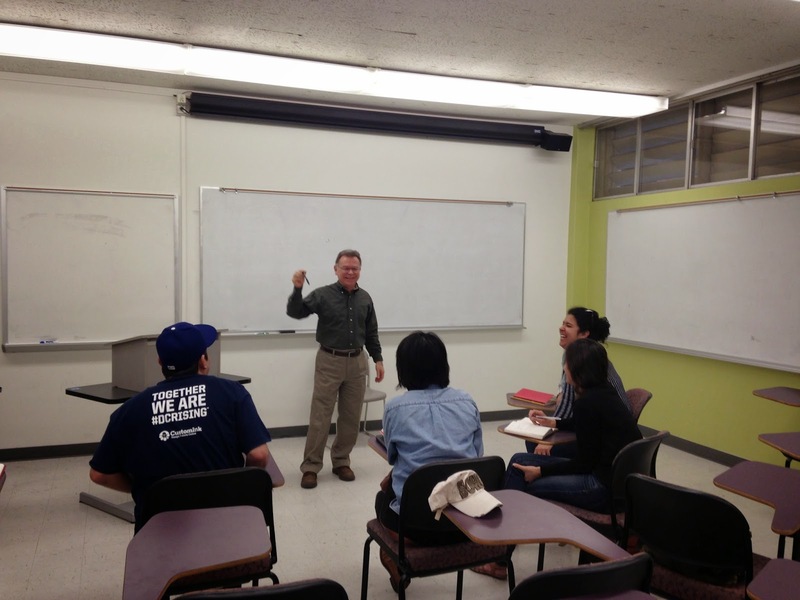 Special sessions during these first two gatherings (2013, 2014) were provided by Notre Dame professor and poet Orlando Menes and MFA alum and CantoMundo fellow Diego Báez. Year 3, this past February (2015), was organized by ASU MFA candidate Lauren Espinoza, and would not have been possible without the generous collaboration and funding of ASU's Virginia G. Piper Center for Creative Writing and ASU's graduate Creative Writing Program. 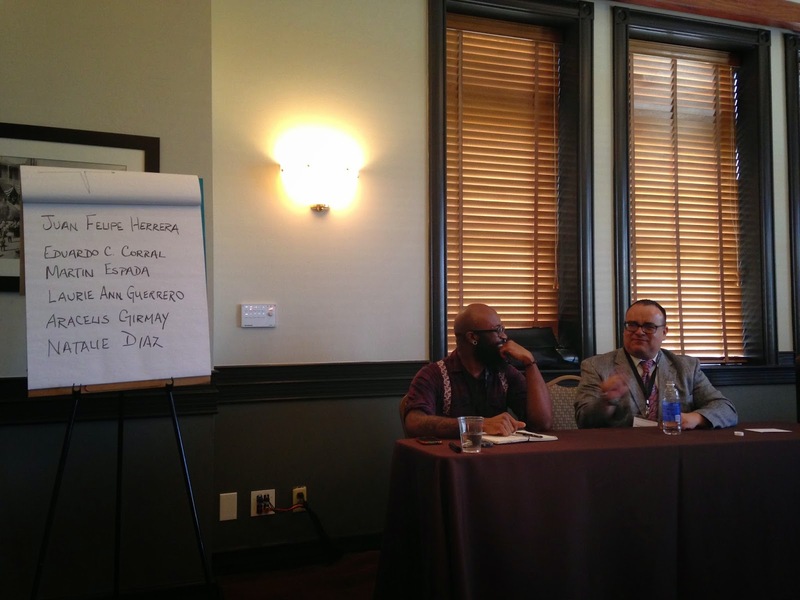 Special sessions were provided by Alberto Rios, Cynthia Hogue and Rigoberto González. Gatherings like these, and what they represent, are a cornerstone of our mission. Attending Letras Latinas Writers Initiave ASU conference “Desert Night, Rising Stars” became a confirmation about the thoughts and emotions that I’ve been tackling throughout my experience as an MFA poet. As a first generation grad student I have given a lot of thought about the voice that I am growing with and into. There are many memories of this conference that continue to speak to me, from Alberto Rios' “Linguistic Bicycle” wisdom, to Cynthia Hogue’s aspects of bearing witness, and Rigoberto Gonzalez's ekphrastic poetry workshop. As a poet that writes about my mother’s adolescent experiences in El Salvador and my father’s in Guatemala, this conference has allowed me to understand that I am a vital aspect of my parents' telling, retelling, and ultimately showing of emotional experiences within these spaces. Before this conference I wanted to find a space where I could understand how my voice can be a channel for these two countries that I have never been to but my parents carry in their minds constantly and talk about. Hogue’s conversation about bearing witness and specifically the secondary witness brought forth a bigger internal and external conversation of my duty as a preserver of my parents’ fragmented memories of these places through the good day-to-day stories and the historical turmoil both countries faced. I was able to understand that in accepting the duty of a storyteller per se, I will be able to give breath to these stories and bring forth the human condition of places that are underrepresented. With that in mind, this conference at ASU allowed me to see what other MFA students are doing and how like them we are processing different concepts that are rooted from the unsaid and the eagerness to find agency in our voices. The beauty of opportunities like these is that you gather more and more ideas to write about and fortify others that you have possibly pushed aside because they haven’t been given the power source they deserve. The Letras Latinas Writers Intitiative gathering was entirely uplifting. Coming from a ethnically diverse family—part Mexican-American, part Caucasian—I’ve always had an interest in writing about my family history and blended identities. Recently I’ve also been drawn to environmental and border issues. At times I’ve felt insecure approaching these subjects. In taking part in this gathering, a small community within a much larger latino voice, it felt like a safe space to deal with those struggles. Ae Hee, Melisa, Lauren, and Steve were so supportive throughout the weekend. Together we were able to have meaningful discussions about our hopes, endeavors, and involvement. It was a special moment to hear their work during our roundtable talk. Each of us write in very distinct styles and come from varied backgrounds. This added a colorful perspective and broadened my notion of latino poetics. I was particularly able to strengthen my connection with Melisa by hosting her in my apartment. Though we had attended UC Riverside as undergraduates, I did not know her or her work well. The first night we spent a lot of time reading each other’s poems and discussing a shared interest in ekphrasis, our MFA programs, and our writing purpose. This bonding time was very memorable for me, and I look forward to keeping in touch with Melisa and rest of the group. Since the Letras Latinas Writers Initiative gathering, I feel more confident in my identity as a Latina poet. I am so very grateful to the initiative and to this year’s participants. Thank you for inviting me into this wonderful community and allowing me to see the importance of our voices. It is an experience I will always treasure. 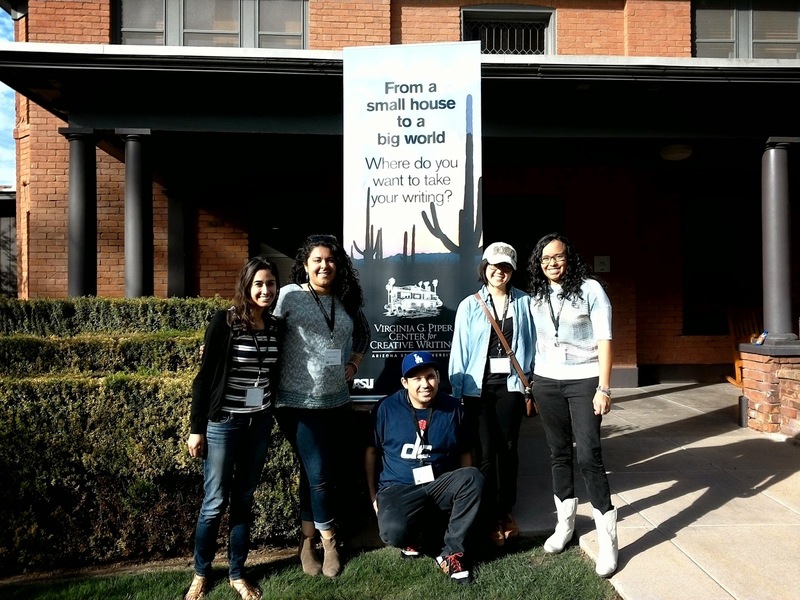 I really enjoyed my time at the 2015 DNRS Writers Conference with my Letras Latinas Writers Initiative cohort. On the last day of the conference, the five of us, Jacqueline, Lauren, Melissa, Ae Hee and I decided to form a book club, in which we would all read one poetry book once a month and discuss it. So in that regard, we decided to stay in touch well after the conference ended. We mentioned that the first book we would like to discuss would be Dexter L. Booth’s Scratching the Ghost. 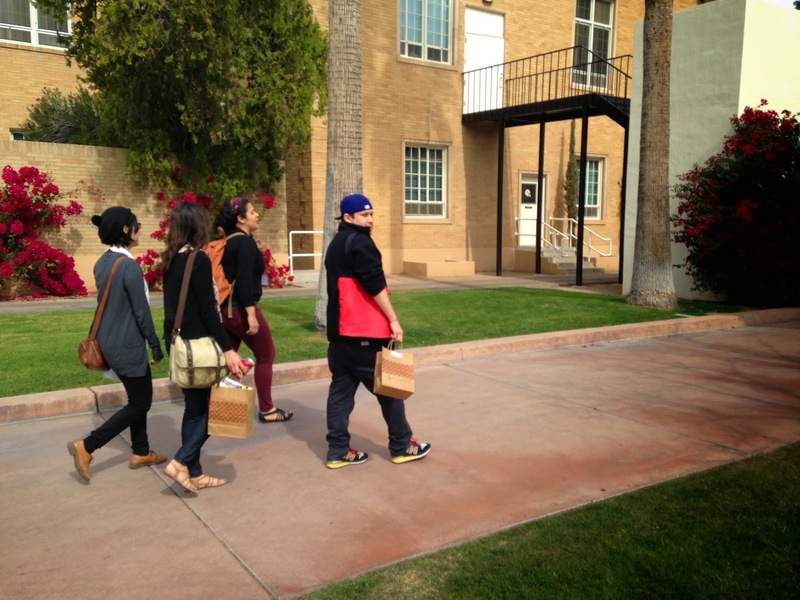 After our final conference event, we left for the Phoenix Art Museum. After the museum, we stopped by a grocery store before we went home to order takeout and discuss poetry. As we were driving away from the grocery store, I realized that I had forgotten my poetry book Scratching the Ghost inside of the grocery store. I lamented this, and Lauren, who was driving, decided that we should go back to look for my book. I mentioned that we didn’t have to go through all this trouble. Once we returned, I got out, while Jacqueline, Melissa, Lauren and Ae Hee, waited in the car. I came back out and told them that I couldn’t find my book, but that I was grateful that we came back to look for it, and that we could head home. My suggestion did not satisfy any of them, so Lauren parked the car and the five of us looked throughout the entire grocery store for my book, and Lauren ended up finding it in the beer section. We then went home and ordered Thai food, and ate to our heart’s content and then we read and commented on each other’s poetry well into the night. It was lovely to remember what the sun felt like and how many colors the world really has after months of snow and white and grey in South Bend, IN. This was my first time attending a conference and I did not know what to expect. However, Desert Nights, Rising Stars and the talks about ekphrastic poetry by Rigoberto Gonzalez, the nature of language with Alberto “Tito” Rios, and the poetics of witness with Cynthia Hogue were educating and, above all, inspiring. Especially the last two, as they spoke to me as a “third-culture kid” who sought to reconcile the different cultures I have lived through and continue to live within me. The trips to the eateries surrounding ASU and the Phoenix Art Museum were great, but it was the “Salon” that really completed this experience for me. 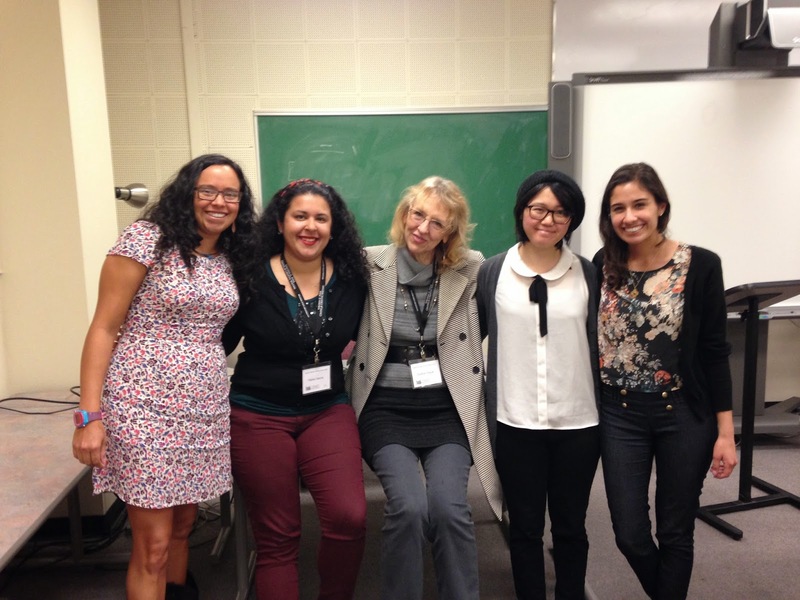 The time and poetry shared with the new Letras Latinas Writers Initiative group (Lauren! Jackie! Melissa! Steve!) and the kind people that invited us into their home (Bojan Louis and Sara Sams) were truly memorable. While we ate thai curry, played music, and commented and brought each other up sincerely in our writing, I could not help but think just how amazing it is that we connected with each other despite having been strangers for most of our lives. I am very thankful to everyone who made this experience possible, be it by organizing or hosting, and I truly believe that gatherings such as these are blessings to any MFA student who is ready to explore beyond his/her own world and writing.